Apple skin contains compounds and fiber that help the digestive tract and also relieve Apple Nutritional Benefits involves minerals, Vitamin C & B complexconstipation. Another ingredient found in apples is boron. It helps in strengthening your bones and protects you from osteoporosis. The anti antioxidant activity that follows after consuming apples prevents your cells from oxidative damage. Studies show that apples contain soluble and insoluble fibers including pectin, that helps keep your cholesterol level healthy. In addition, apples also contain flavonoids and phenolic compounds that help prevent and relieve inflammation, normalize fat content in your body cells and regulate blood pressure. Research has also shown that flavonoids help lower heart disease risks and improve heart condition. Phenolic compounds in apples help enhance immunity and fight cancer. The properties of antioxidant activity in apples have shown to be very effective in reducing risk of many types of cancers including colon, liver, lungs and breast cancer. The apple skin contains four times more antioxidants than in the flesh. It contains quercetin that prevents your body cells from oxygen damage thus fighting against cancer through antioxidant activity. Apple cider vinegar is beneficial for health conditions such as kidney stone, heartburn, diabetes, allergies, arthritis, high cholesterol and flu. Apples have a low calorie count and are rich in dietary fiber and thus aid in digestion process. Apple nutritional benefits contain vitamin C and beta carotene in good quantities that helps your body build resistance to disease and infections. A good source of B complex vitamins, apples help in metabolism and synthetic processes of your body. Health benefits of Apples involve enough amounts of minerals such as potassium, calcium and phosphorus that help maintain a normal blood pressure and heart rate. Phloridzin is a flavonoid unique to apples and promotes and strengthens lung health. Apples contain an important digestive agent called pectin which is a soluble fiber. A single apple gives you the same amount of fiber that you get from a single bowl of cereal. Pectin also decreases the need for insulin in a diabetic patient and thus helps manage the disease effectively. 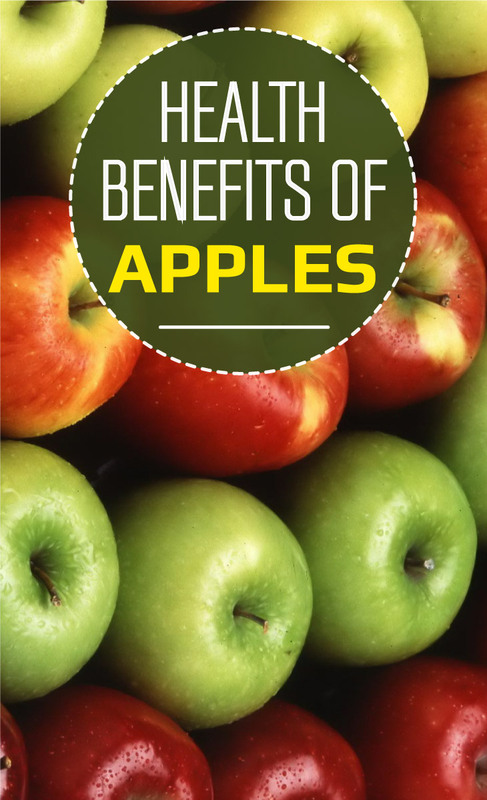 The tartaric and malic acid in apples aid digestion and alleviate symptoms of liver disorders. Moreover, complex carbohydrates and phenolic compounds present in apple pulp give you sustained energy and it also has positive effects on your lungs that aids in easy breathing. Apple skin contains flavonoid agents that protect you against risk of liver cancer.